Part of the beauty of the iPhone from its launch date was the notion of a Mac you could fit in the palm of your hand. That makes it ironic that, for so many developers, mobile platforms in general have turned into a way to fragment software, to make it run fewer places instead of more. There’s something to be said for designing to a specific mobile device, but on the other hand, how many developers would want to restrict where their creations run? And particularly in music, isn’t the appeal of mobile creation the ability to have your tools work in more places? Maybe targeting just one gadget is the right choice for a given tool, but it shouldn’t be the only choice. 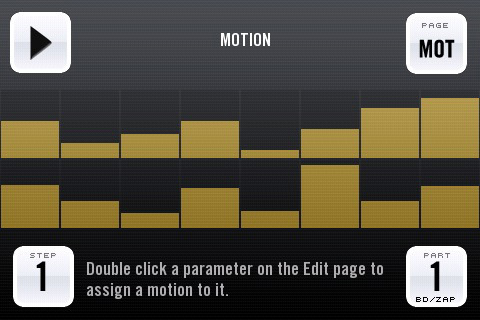 On the iPhone, the application Thump has plenty in common with a range of mobile music making tools. It’s simple but fun, a groove box with sequencing, subtractive synths, drums, and a set of basic effects, plus the ability to load your own samples and export songs. What might not be immediately apparent is that under the hood, Thump makes use of the open source environment openFrameworks. As a result, the same code runs on iPhone, Mac, and Windows, as well as Linux. (It’s not distributed for Linux, but it could be. Hint, hint.) Creator Marek Bereza gives back, too – he ported the openFrameworks audio library to the iPhone, where it’s available to anyone. Updated Marek notes in comments just what this means. The video below is, essentially, the same app. In place of the iPod screen, he has used a massive lattice of physical controls. A separate installation at the same show used a large touchscreen and simplified interface. And this really demonstrates what cross-platform means. Guy Kawasaki in the 80s mocked “ports” as a cheap wine. The idea is not to simply dump your code on a different platform and hope for the best – in fact, in this case, the changes from one platform to another were radical. The key is maximizing what’s essential, what really is not specific to a single device. Physical Sequencer from Marek Bereza on Vimeo. Creative Applications has a detailed write-up of the installation with more documentation. If you’re interested in creating your own projects, oF has an elegant syntax based on Processing, but adapted to C/C++ coding paradigms and libraries. Having this as a foundation means more freedom for users and developers alike, the ability to run where you want, and a shared community of artists helping one another out. It does not mean sacrificing revenue, either – which is important, because revenue is often what enables (and encourages) developers to make new things. Here, we see a commercial mobile tool and distribution via the iTunes store, with free-as-in-beer distribution of desktop apps. But even the Free Software Foundation actually encourages charging for distribution – and to many people, the FSF is the most extreme example. The bottom line is, you’re free to create what you want, where you want – and it doesn’t even have to have a price of free. The use of openFrameworks is possible because the iPhone allows the execution of native code. Apple does not allow the Java virtual machine, which locks out many useful platforms and tools — including Processing. Naturally, that should not be the case with forthcoming non-Apple platforms based on Linux; more on that soon. Thanks to Memo Akten for the tip — and for his exceptional documentation of iPhone openFrameworks development. On the iPhone, Intua’s elaborate Beatmaker software and David Wallin’s bleep!box have both been made with libnui. I want to single out bleep!box because of its UI – note how UI elements are simplified and scaled to the size of your fingertip. That’s something that, speaking of multiple platforms, could be equally important with touch hardware coming to Mac, Windows, and Linux platforms (some of it here already). I saw a huge fan of Windows tablets loving Propellerhead Reason on a tablet. He probably would be less enthused running Reason or Record on a touch interface; the UI elements are way too small. bleep!box is also worth a look for the same reason as Thump: elegant UI, simple functions, and a lot of fun. Pure Data, the open source patching cousin of Max/MSP, can also run on mobile devices. It’s currently powering the application RjDj, but because Pd is free, that could be just the beginning. In May, I wrote about the work being done by Hans-Christoph Steiner, who has been porting Pd even to ancient PDAs and iPods – including those, notably, without native floating-point capabilities (the kind of number crunching usually associated with sound). OK, kids, you won’t believe how easy this is. Once you have Pure Data installed on your your iPhone or iPod-Touch, creating and uploading your own sound-processing and sound-generating patches is as trivial as copying a text file to your device! You’ll still need an Apple Developer License, but because Pd patches are treated as media files, they don’t have to go thru Apple’s elaborate code review — so, you can just dive right in, turning your phone into a pocket synth within minutes. In this 3-hour hands-on workshop, interactive sound whiz and Pure Data developer Hans-Christoph Steiner will lead you through all the steps. Hans-Christoph will be talking Pd on the iPhone at a conference next month at Carnegie Mellon University in Pittsburgh. That will also include Memo Akten and Zach Gage talking about openFrameworks. And for nearly-entirely open source hardware, there’s a tantalizing-looking workshop combining Android with Arduino, too. There’s quite a lot more to say about this, but I hope this whets your appetite. And, of course, riding the train to Pittsburgh or your nearest university or open source workshop, now you’ll have Thump which which to make some thumping tracks on your iPhone.